So I was searching for a quick and easy gluten-free bread to soak up all the saucy sauce of my shakshuka and I came over these popovers. 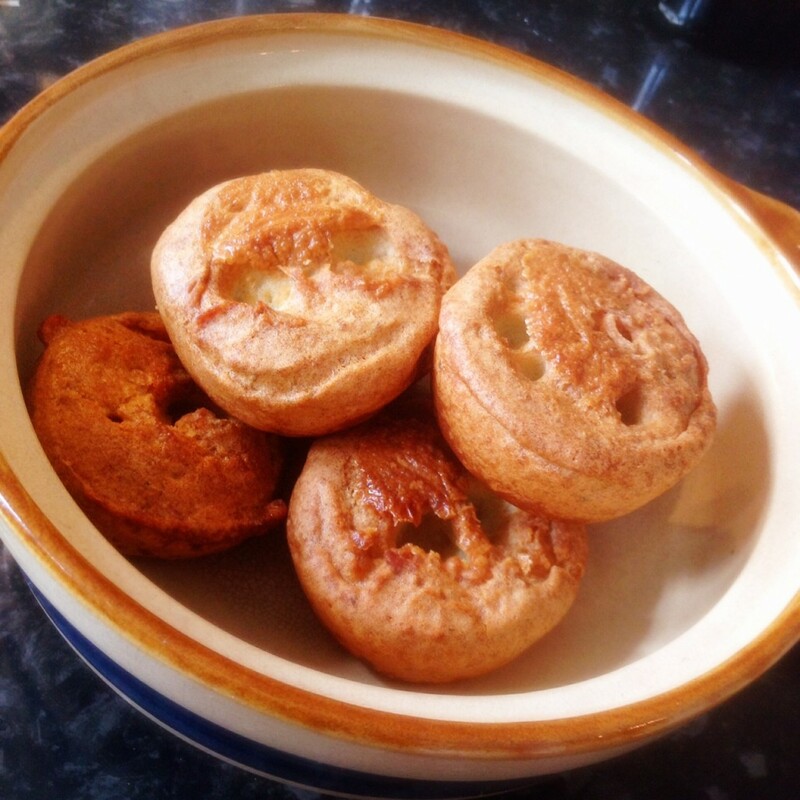 A little research, and tasting, has revealed that these are nothing more but the humble Yorkshire Pudding. The staple of so many a roast dinner. What’s nice about these though is that it made me realise that outside of the roast context (and the important toad in a hole context) I’ve never really eaten Yorkshire Puddings with very much. Why is that? Why is it that we don’t eat these delicious morsels more often? Now that I know how easy, quick and fool-proof they are I’ll be making them every time I’m short of bread. These are gluten and dairy free though you can substitute the flour and milk for the real deals in identical portions. Oven to 220°C. When that getting hot, prep your muffin tin by putting a teaspoon of oil into each muffin mould. When the oven’s at heat pop the tray in and get it piping hot. 10 minutes should do. In a mixing bowl or stand mixer, whisk everything up until it’s lump free. Remove the muffin tin and carefully pour the batter into each mould. It should sizzle as you pour. Pop them back in the oven and wait for them to ‘pop over’ (oh right, that’s where the name comes from…). Don’t open that bloody oven! After 25 minutes they should be risen and golden brown. These are delectably light out of the oven and very moorish. I’ve just made a batch to have with some courgette soup…you have been warned.